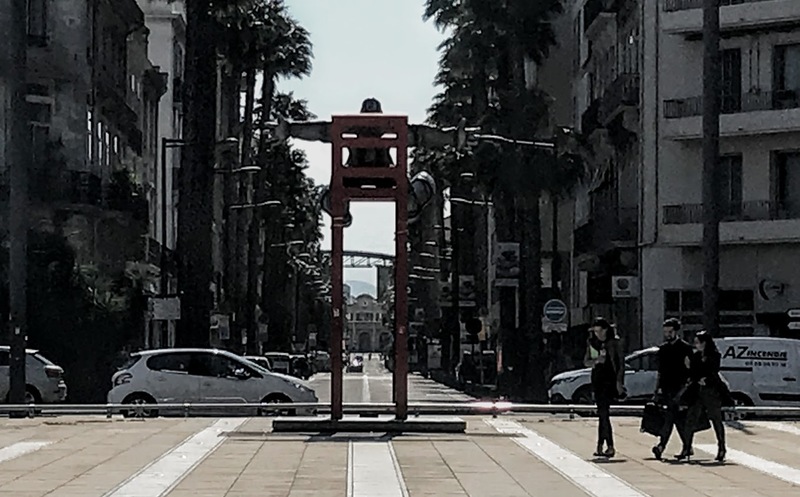 During my visits to Perpignan this week, I enjoyed the statue of the Spanish surrealist artist Salvador Dalí, Dalí en Levitation, outside FNAC on the place de Catalogne and facing towards the city’s train station, la Gare de Perpignan. The statue, which was put in place last year , was originally created in 2000 by the two artists, Sabine et Eric, known as ‘Les Pritchards.’ It was inspired by Dali’s 1965 painting, Le mystique de la gare de Perpignan, and was originally placed on the roof of the station. Dalí en Levitation shows the artist sitting on a high red chair at the entrance to Perpignan, 3.6 metres wide and 2.3 metres high. 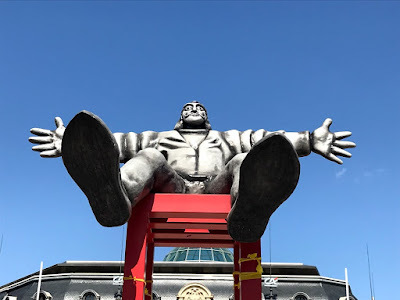 He is facing towards train station, which he proclaimed the centre of the universe, his arms open wide, welcoming visitors to the Catalan capital. For Dalí, the station in Perpignan became a place of genuine sanctity, a pivot of the cosmos that offered a unique perspective on the entire universe. Two years later, Dalí completed his celebrated Le mystique de la gare de Perpignan in 1965. It is a huge oil painting on canvas, measuring 296 cm x 406 cm, and now hangs in the Museum Ludwig in Cologne. Dalí's 1965 homage to Perpignan is a surrealist adventure, and before and after working on the painting he paced the platforms of the station, taking photographs and measurements, concluding in 1966 that the measurements of the earth – and indeed the weight of God – are mirrored in the structure of Perpignan station. Perpignan is just 22 minutes by fast train from Figueres, the Catalan town where Salvador Dalí was born and died. And just as Shakespeare has promoted Verona, so Dalí has become a great commercial asset in promoting Perpignan. In appreciation, the city council renamed the square in front of the station, Place Salvador Dalí. The building, which opened in 1858, is a handsome but typical example of the style of stations built at that time throughout southern France. The sign inside the station welcomes travellers to the ‘Gare de Perpignan: Centre du Monde’ – which is a modest claim compared to Dalí’s proclamation that this is the centre cosmique de l’univers. 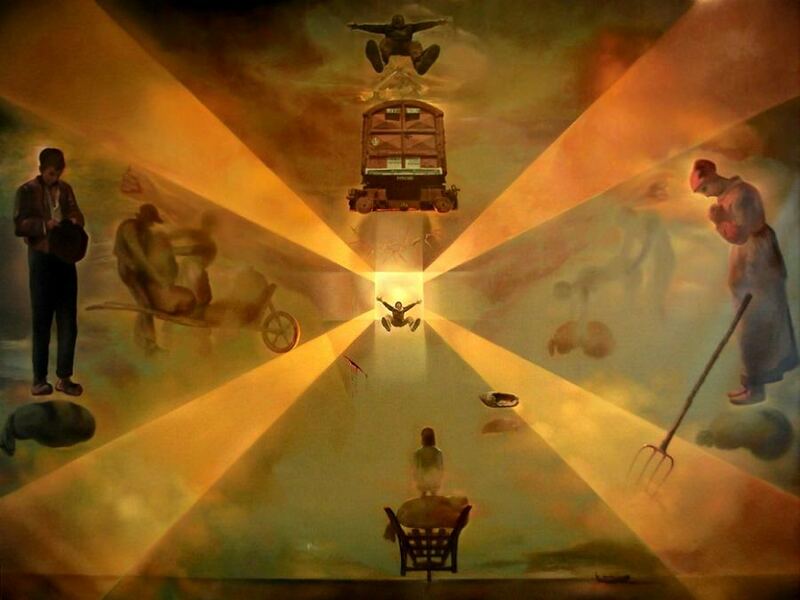 The painting shows the railway station of Perpignan, but with various additions that are examples of surrealism. La Gare de Perpignan encompasses several artistic techniques. There are several axes of symmetry, and a lot of emphasis is placed on the use of colours to depict light in various effective ways. Earthly colours such as dark brown and yellow are used, and different gradients of these two colours are used throughout the painting. The sacrifice of the son is imaged in the form of Christ on the Cross, with his crown of thorns, floating in the centre of the composition. The bleeding wound of Christ is associated with the farmer’s fork on the right, thrust into the ground. Dalí is represented twice in the vertical axis: he appears in the light at the centre of the image, seen from below, floating with arms spread, and again at the top of the painting. At the bottom of the painting lies a calm sea with a boat, an ancient symbol of the passage from life to death and of the Church, reinforcing the theme of Christ’s sacrifice. Above the sea, a woman seen from the back watches these scenes, immobile, and recalling the helplessness of man facing death, symbolised not only by the bloody wounds of Christ, but also by Dalí, who is spread-eagled and seems to fall into nothingness. At the top centre of the painting, a train emerges from nowhere and is a reminder of the railway station in Perpignan. The left side of the painting shows the embodiment of positive values: the couple on the bags of wheat represent labour, and the man in a meditative pose embodies respect. The right of the image shows the embodiment sins and suffering: the man and woman represent lust and the woman represents mourning. The two figures flanking the far left and right sides are inspired by The Angelus, a well-known religious painting by the French artist Jean-François Millet.